These are 2019-2020 Bruahy Mountaineer Cheerleaders!! Congratulations!! Science Fair will be held on Thursday, May 2, 2019, in the New Gym. Yearbooks are $10 each. Order yours now!!! Letters from the school nurse will be going home discussing our new Telegealth Program. Please read the letter and brochure. If you are interested in your child participating please return the consent form completed and signed. Girls play at 11Boys play at 12Bus leaves at 9:30 sharp!! Thursday, January 17th is 8th Grade Night at 5:45pm If you have any questions please contact Ms. Stacy. The games today at Moffett will start at 4:30, the bus will leave at 3:30. The girls games scheduled for Weds against Roland have been cancelled!!! The boys teams will still travel to Roland at noon on Weds. 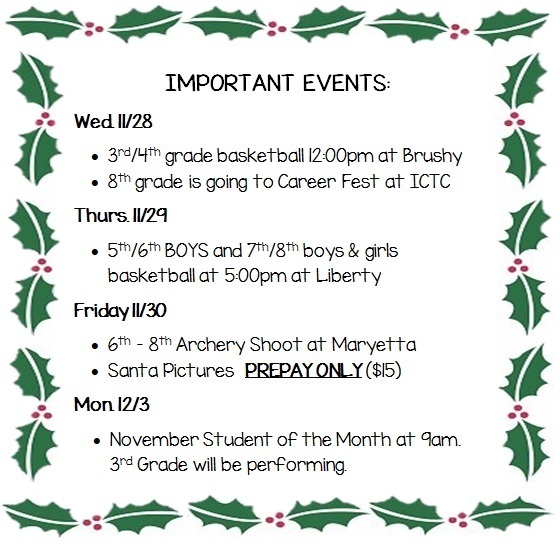 The 3&4 grade festival scheduled for this Saturday at Moffett has been postponed until after Christmas!!! Please share!!! !